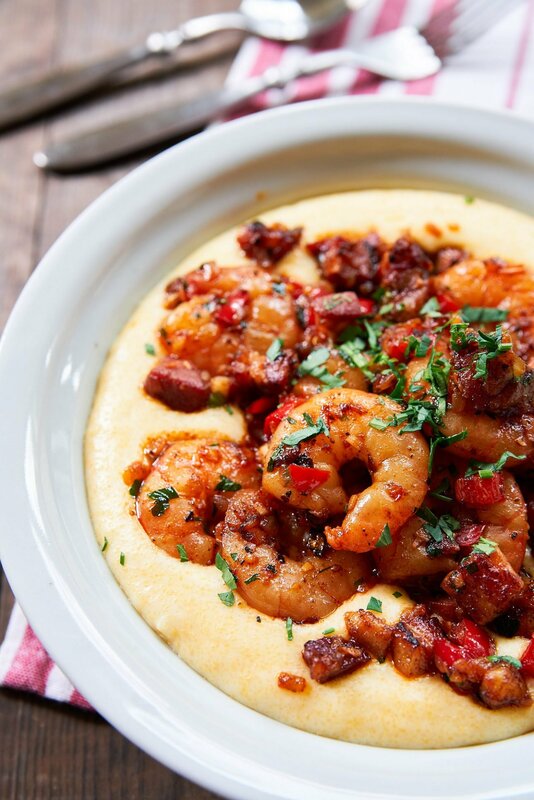 My Shrimp and Grits are topped with a mound of garlicky shrimp, smoky ham and caramelized peppers, on a rich flavorful bed of cheesy grits. With a few simple changes to pack in a bit more flavor, my take on this southern classic is still just as comforting, and yet it's impressive enough to wow guests at a brunch party. Like any structure, constructing a great Shrimp and Grits requires a robust foundation. Cooking the grits in water makes them taste… well… watery. Cooking them in milk makes them rich and creamy, but they still taste pretty bland. To really take my grits over-the-top, I like to cook them in a 50:50 blend of chicken stock and milk. Along with the cheese that gets added at the end, the chicken stock loads the grits up with umami producing amino acids like inosine monophosphate and glutamate. 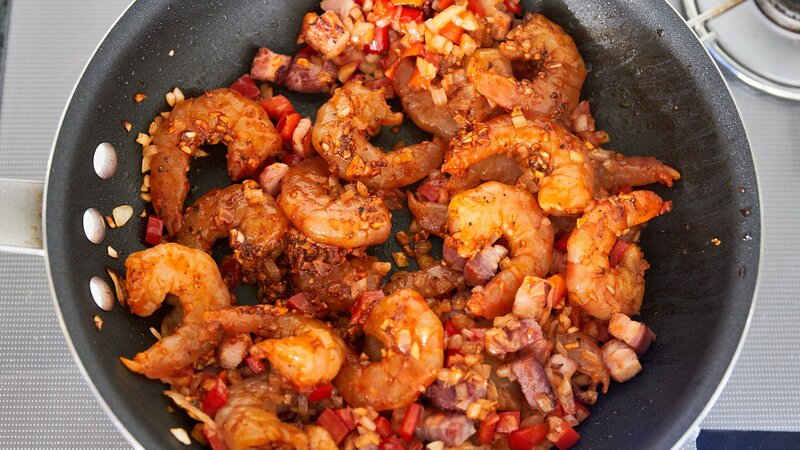 For the shrimp, I have a have a few tricks to improve both the texture and flavor. The first thing I like to do is to brine my shrimp after peeling them in baking soda and salt. This gives the shrimp a wonderful snap like a great sausage. You can read all about the process in my Fried Wonton post. While I recommend this step, if you’re pressed for time, it’s not necessary. The second trick is to marinate the shrimp with garlic and smoked paprika. The smoked paprika imparts a marvelous smoky flavor that pairs perfectly with the ham. 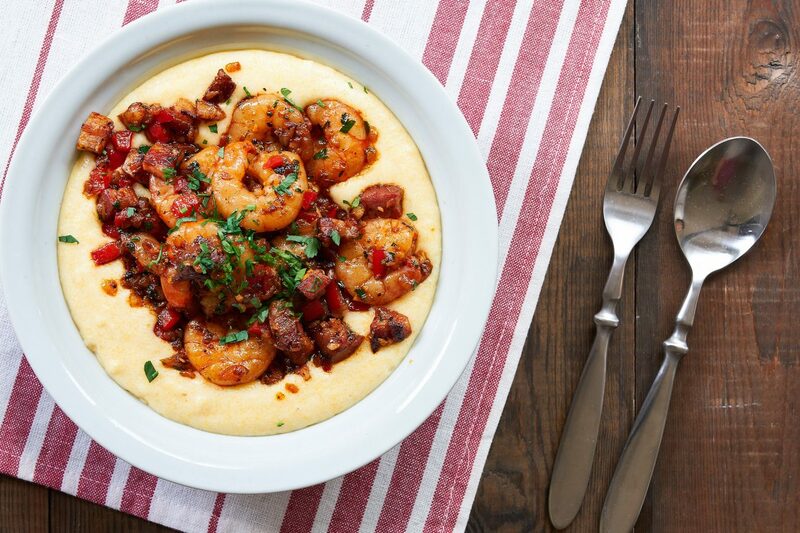 When the marinated shrimp is fried together with the caramelized onions and red peppers it makes for an intensely flavorful topping that makes these Shrimp and Grits mind-bogglingly good. Because the grits require some attention and the shrimp cooks relatively quickly, I like to prepare the grits first, and then fry the shrimp. This also gives the grits a chance to cool down a tad so you don’t burn your tongue when you try and scarf this down. And scarf you will, as this is one dish that’s impossible to stop eating once you’ve taken a bite. 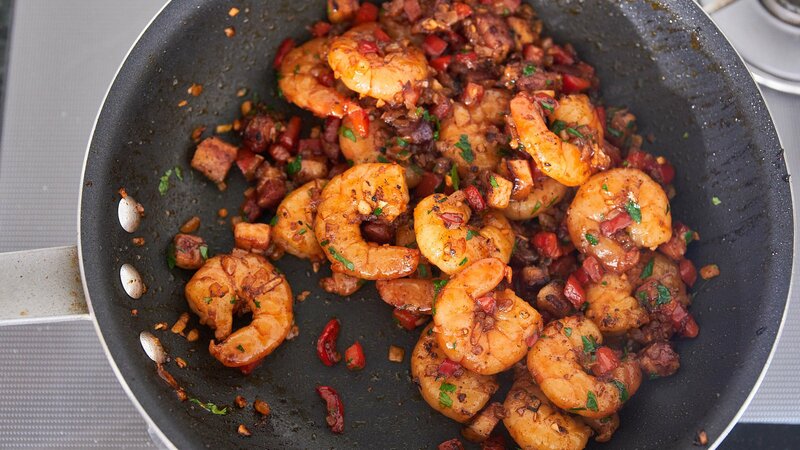 Make the marinade for the shrimp by stirring together the olive oil, garlic, smoked paprika, salt and black pepper. Add the shrimp and toss to coat evenly. 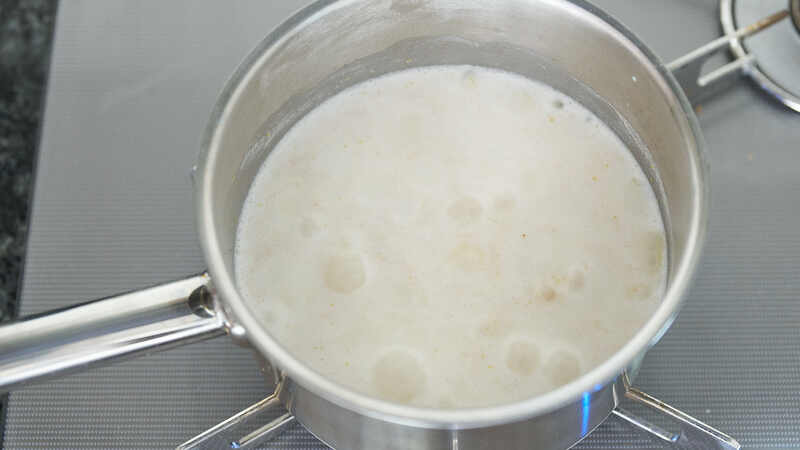 To make the grits, add the chicken stock and milk to a pot and bring to a boil. Add the grits, turn down the heat to low and cook for 15-20 minutes, stirring regularly to keep the grits from burning. If the grits get too thick, add a little more milk to maintain a thick porridge consistency. 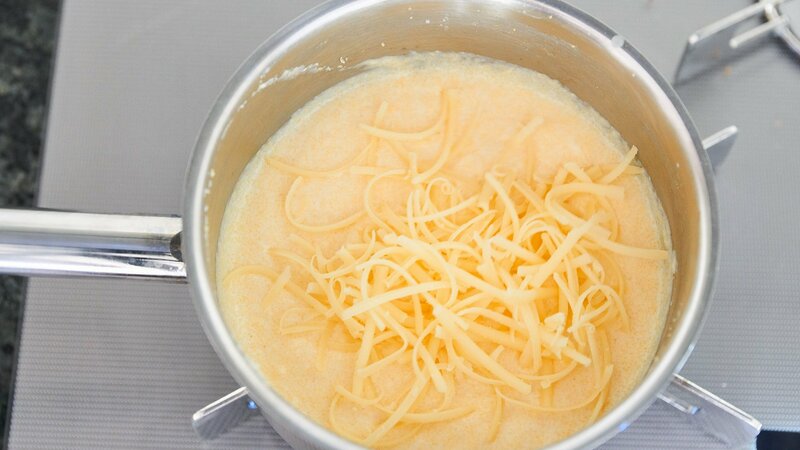 When the grits are thick and creamy add the cheese in a few batches and stir well until the cheese is fully incorporated. 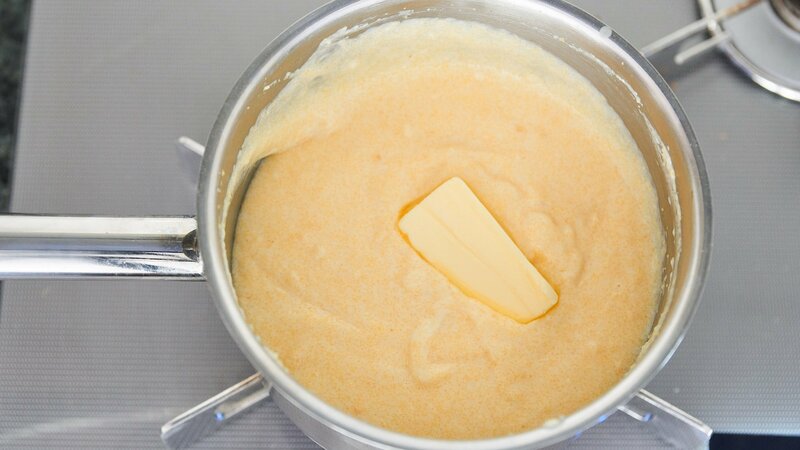 Add the butter to the grits and and stir until the butter is melted. Heat a frying pan over medium heat until hot. 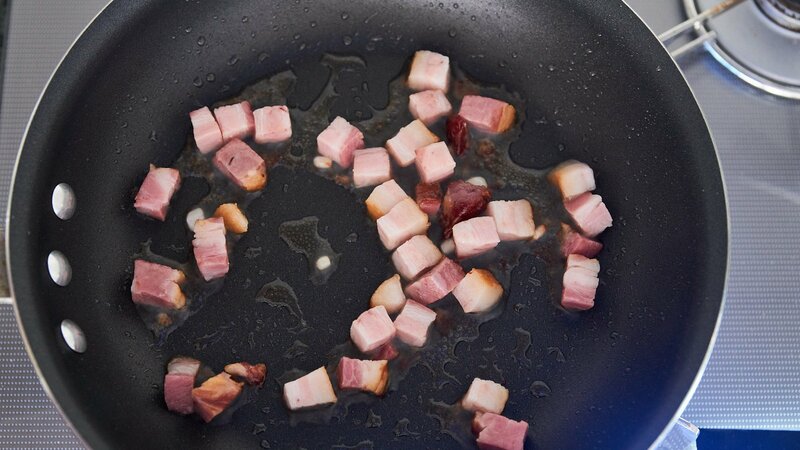 Add the olive oil and ham(or bacon) and fry until it starts to brown. 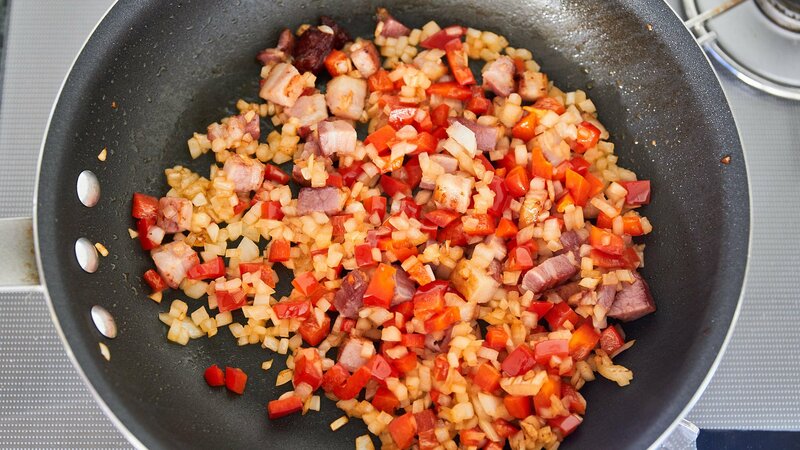 Add the onions and bell peppers and saute until the onions are soft and translucent. 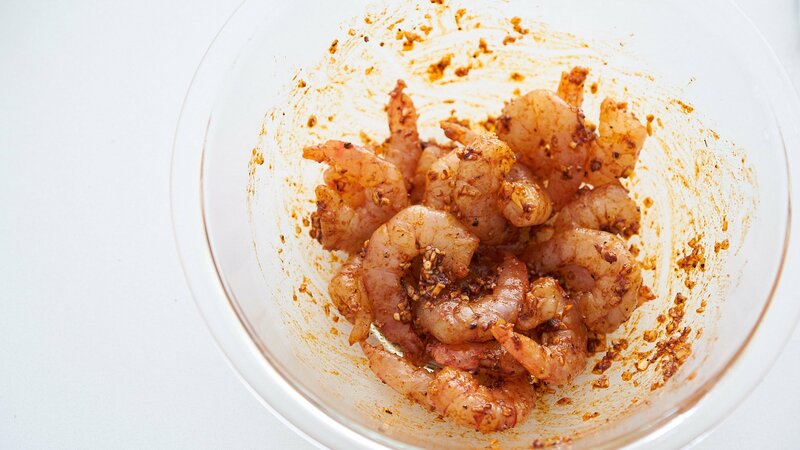 Add the marinated shrimp along with any remaining marinade in the bowl to the pan and fry the shrimp, tossing regularly until the shrimp is just cooked through. Be careful not to overcook your shrimp, or it will get tough. Drizzle the shrimp with lemon juice to taste and then add the parsley. Serve the shrimp over the grits with your favorite hot sauce.